The question is attacked by computation and experiment. The computational methodology involves corrections to the local MP2-F12 energy involving the separation of orbital pairs that are treated with a coupled clusters method. The straight chain (having only anti arrangements about the C-C bonds) and the hairpin conformer (having three gauche arrangements) were completely optimized. The C17H36hairpin isomer is shown in Figure 1. 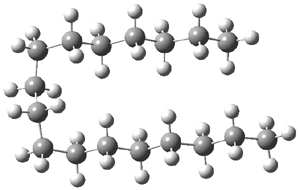 For chains with 16 or fewer carbons, the all-anti straight chain is lower in energy, but for chains with 17 or more carbon atoms, the hairpin is lower in energy. Gas-phase low temperature IR and Raman spectra suggest that dominance of the hairpin occurs when the chain has 18 carbons, though careful analysis suggests that this is likely an upper bound. At least tentatively the answer to the question is that heptadecane is likely the longest alkane with a straight chain, but further lower temperature experiments are needed to see if the C16 chain might fold as well. Interesting that humble old MM2 calculations 15 years ago, which of course have an explicit vDW term, predicted that the transition from extended to hairpin conformation occurs for unbranched alkanes at C17 to C18 (http://pubs.acs.org/doi/abs/10.1021/ci9704219).